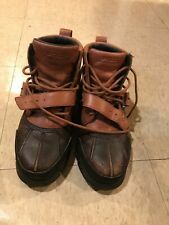 POLO RALPH LAUREN Dover II Mens Brown Leather Winter Duck Boots 0862 - SIZE 10. Condition is Pre-owned, great condition aside from no insoles in both shoes. Shipped with USPS Priority Mail. Black Leather. Made in Italy. Ralph Lauren "Worldham" leather boots.